Keep it cool in the Cowtown 11-inch tall men's western boot. The ivory leather upper is accented by a colorful teal and copper stitching and pairs perfectly with the distressed golden brown foot and matching pull straps. The dark brown leather panel on the heel and quarter seam are subtle details that set this boot apart. Its square toe and unit heel allow for a relaxed fit in the stirrup and the cushioned insole offers lasting support for maximum comfort throughout the day. This style is proudly Made in the USA with global parts. I have been wearing these boots for about 6 years now. They are the most comfortable and durable boots I have ever owned. I have worn a lot more expensive boots and they don't hold up like these boots. These things are awesome and you can't beat the price. I bought these boots approximately five years ago. I wear them daily and have just recently had to look into getting them resoled. I got these boots about a year ago and they have exceeded my expectations.First of all, the design is amazing. Second, it is really comfortable and fits perfectly. After a year and they are going strong, nothing at all wrong with it. 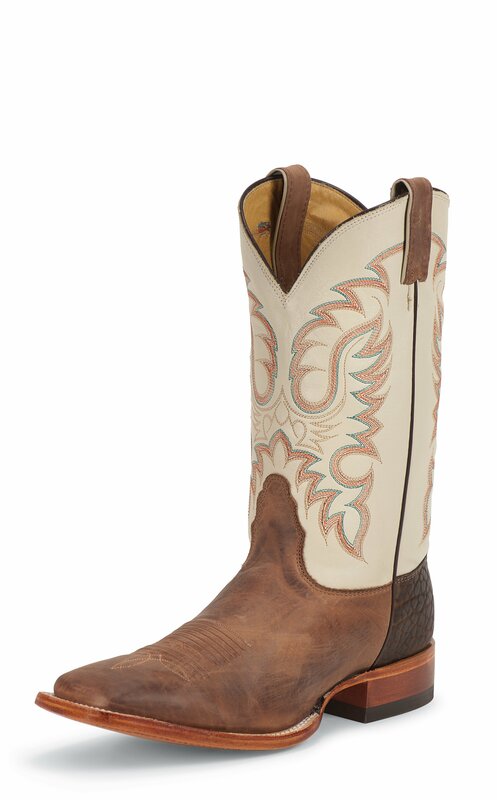 Lastly, they are handmade in the great state of Texas, so you can't not get these boots. Better than name brand boots, and way cheaper. It has been a while since I purchased my Nocona boots. I have to say they are the best fitting boot out there. The price on these is way cheaper than the other brands of boots. Best of all, they look really good.